“My wife’s family rents a house for a week every July in Biddeford and this was the first year since we’d been together (coming up on 13 years now) that I was able to make it for the entire week. I live in Clifton Park, NY, which is just north of Albany, and the only striper action we see is for a few weeks in April-May when the stripers come up the Hudson River to spawn. In the weeks leading up to the Maine trip, I had been checking out fishing reports with the hope that I’d be able to catch even a single fish. The reports were saying that clams and mackerel were the way to go to catch stripers around the area. Unfortunately, the nearby bait shops said that there was an issue with their clam suppliers, so I’d have to settle with frozen herring for the week. Even though it was “vacation”, I was up every morning between 4:45-5:30 to go out fishing before everyone else got up. Being in Maine, there’s a huge tide change (I believe it’s around 10 feet) and at low tide, you have to walk about a half mile on the beach to even get to the ocean. 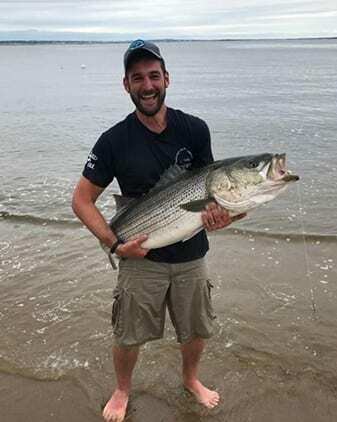 The house is situated in a smaller bay area, but there is an island that you can walk to at low tide where there were reports of some stripers being caught. Of course, with my luck, there was an early morning low-tide for the week that we were there, which meant that my waking up early just meant that I had to make that long trek out to the water before my coffee could even kick in. I fished Saturday-Wednesday mornings from when I got up until anywhere from 9:30-11 and was able to catch a few smaller stripers, with the largest being around 26″. For me, I was just ecstatic that I was able to catch anything! I didn’t fish on Thursday as we had plans with the family, so I knew that Friday was my last real day of fishing before we left on Saturday. Friday morning was the most active morning for me, catching 6 fish until I ran out of bait around noontime. I was contemplating whether or not I should head out and get some more bait for the afternoon but decided against it as I didn’t want it to go to waste since we were leaving the following morning. Not being the type to just be able to sit on a beach chair and relax, I decided to give the Fishbites Long Lasting EZ Clam Strips a try. I had bought a bag in June but I wasn’t able to get out to do any fishing until our trip to Maine. I cut off two strips, set up both of my poles in their sand spikes and went back to sit in my beach chair about 30-40 feet away. I can’t even remember how long I was sitting there before the craziness occurred. I’m talking to my wife when all of a sudden, I see my rod tip start to bend. I paused for a split-second, thinking that it was either just the waves or some seaweed on the line, but the rod tip continued to bob. I jumped up and started running to my pole, only to see it crash violently into the sand and take off into the water. You have GOT to be kidding me. I get to where the pole was originally standing and look into the water but it’s nowhere to be found. Flustered, I run back to my wife and give her my cell phone, still not sure what I’m going to do, but assuming that I’m going to have to go swimming. Of course, like any loving wife would do, she yells, “GO GET YOUR POLE!”. As I get back to the scene of the crime, my father-in-law shouts, “there it is!”. I see my pole on the surface of the water about 20 feet out and attempt my best Baywatch impression to get out there before the pole disappears forever. I finally get out there into chest-high water and my first thoughts are, “Why isn’t my pole moving? Is whatever I had hooked on there now swimming free and near me? WOW THIS WATER IS COLD!” I finally wade back to a respectable area in the water and notice that one family has walked over and another is standing on a balcony watching me, so I can’t screw this up! I start reeling in the line, only to find out that while I still have a monster on there, I’m tangled in a buoy. Great. I’ve seen too many fishing shows to know that the abrasion can burn my line. I continue reeling in while facing the buoy, trying to figure out where the line was wrapped so I can get out of this mess. I finally heard people yelling that the fish surfaced and, sure enough, I look to my left and see fins above the water. At least now I know which side of the buoy my line is tangled on. Wading over towards the buoy, I’m able to free my line and can instantly feel the true weight of this thing. Finally, it’s just me against the fish. My God, this is the largest fish that I’ve ever seen, and it’s still a ways out. Thankfully, the fish had given most of its fight up by this point so it was just a matter of wrestling this beast on to the beach. I finally get it up on to shore and all I can do is laugh and smile in amazement that I’m looking at this fish that I just caught. Thank you for sharing Eric! We look forward to seeing more from you now that you’ve experienced fishing with Fishbites!